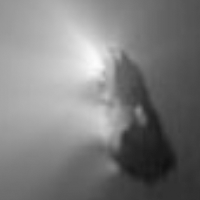 The "Space Academy" series, led by the Johns Hopkins University Applied Physics Laboratory and Discovery Education, takes students behind the scenes of actual space missions and introduces them to engineers and scientists working on some of NASA's most exciting projects. 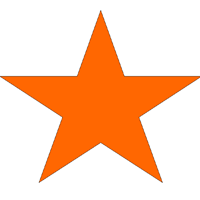 Learn more about Space Academy. 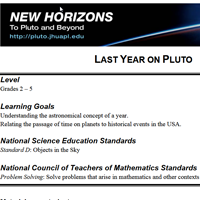 Conduct your own New Horizons Space Academy activities. 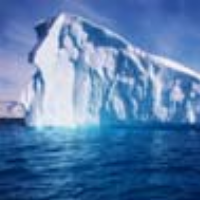 Who Is King of the Ice Dwarfs? 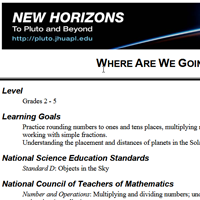 Learn more about Pluto on NASA's Space Place website. 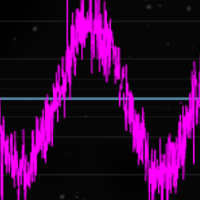 This activity engages students with a hands-on activity and an online interactive to explore the Signal-to-Noise Ratio, a fundamental concept in spacecraft communication. 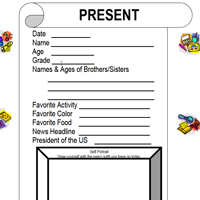 The activity also includes a pencil-and-paper component that addresses relevant topics, such as proportions and ratios. 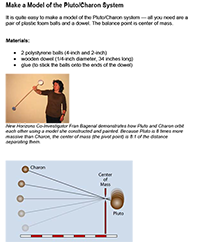 This activity relates an elastic collision to the change in a satellite's or spacecraft's speed and direction resulting from a planetary fly-by, often called a "gravity assist" maneuver. 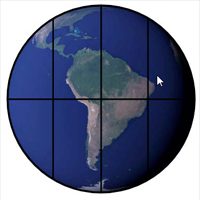 Both hands-on and online interactive methods are used to explore these topics. 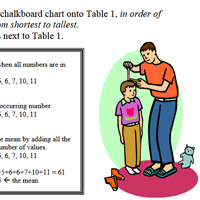 Classification activities that will lead students from simple sorting of familiar objects to classifying materials into liquids, gases, and solids. 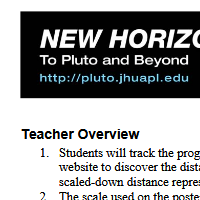 Students will learn that the New Horizons poster depicts a scale drawing of the Solar System. 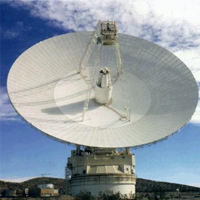 They will use the poster to track the true progress of the spacecraft. 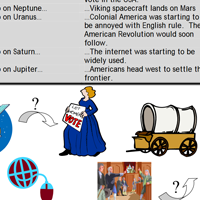 S - Understanding the long distances and timescales involved in space travel. M - Using fractions and multiplication to change scales/units. 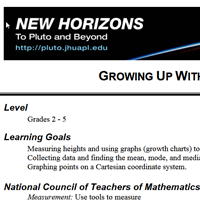 Students will measure their height, analyze the heights of classmates, and predict their height at the time New Horizons is scheduled to fly by Pluto using a growth chart. S - Using a model and measurements to make predictions. M - Collecting data and finding the mean, mode, and median. Graphing points on a Cartesian coordinate system. 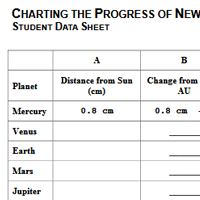 Students will determine the length of one year on the nine planets and match historical events that occurred on Earth one year ago on these planets. 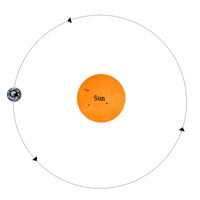 S - Learning the astronomical meaning of a year and the timescales associated with planets with large orbits. 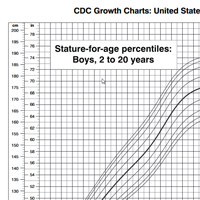 Grades 2-5: Where Are We Going? 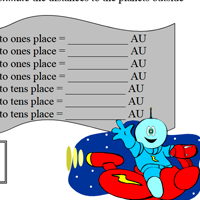 Students take imaginary trips through the Solar System on a spacebus and use math skills to find out the next spacebus stop. 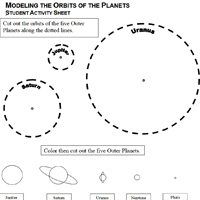 S -Understanding the order and distances of the planets from the Sun. M -Problem solving using multiplication, rounding and fractions. 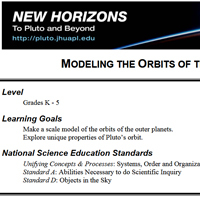 Students will make a scale model of the orbits of the outer planets and explore the peculiarities of Pluto's orbit. S - Understanding the scale of the Solar System. 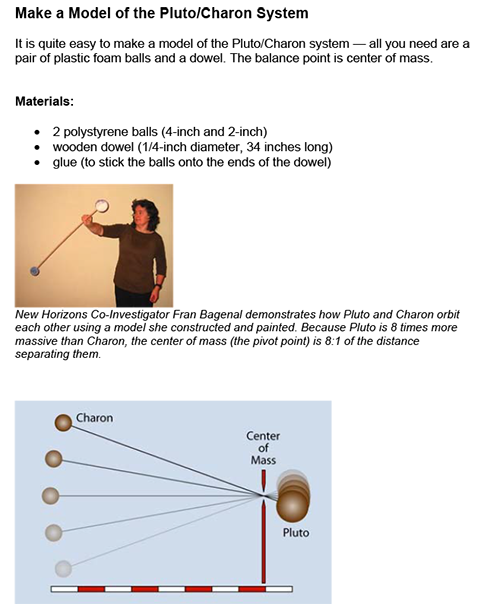 Learning about Pluto's elliptical and inclined orbit. 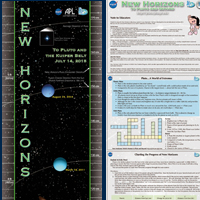 Download Your Own New Horizons Growth Chart poster. 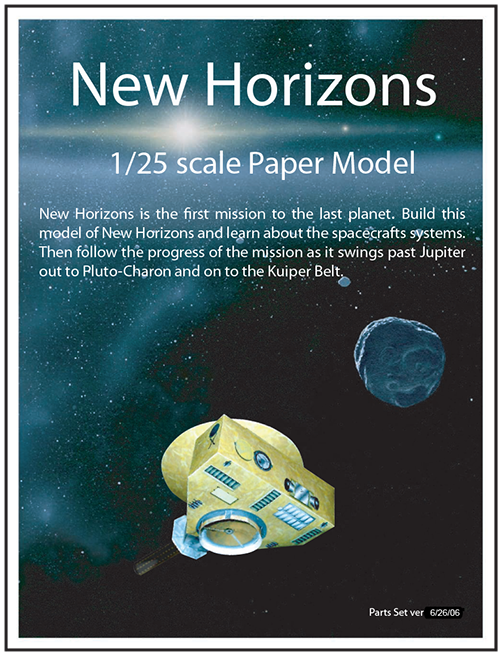 Best suited for ages 10+, build a scale model of the New Horizons spacecraft! 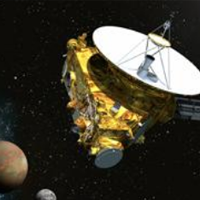 Pluto and Charon are a binary system. Build your own model of a binary system and see what makes it so unique! 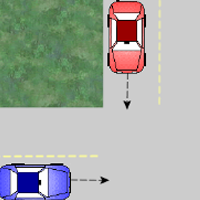 With adult help, children of any age will enjoy this activity. 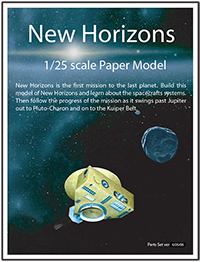 View the New Horizons spacecraft model design diagram! 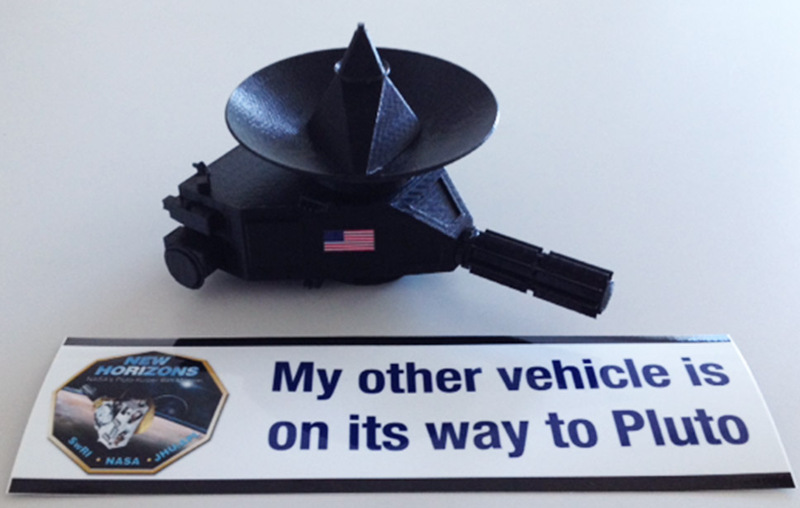 Build your own 3D New Horizons spacecraft model. Below is a zipped file of .stl-formatted printable models including instructions for printing and assembly. We understand that 3D printing often involves trial and error. 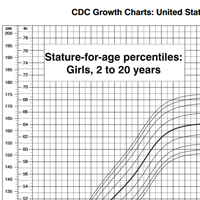 You may make adjustments or changes when printing these models.